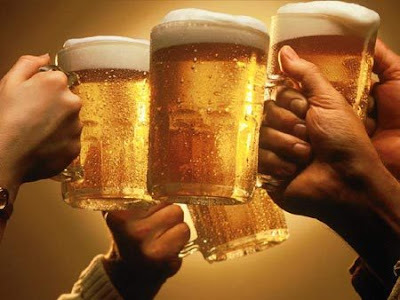 Moderate drinking and cardiovascular health: here comes the beer ~ Health Matters Today! Beer could stand up alongside wine regarding positive effects on cardiovascular health. This is the conclusion of a study conducted by Research Laboratories at the Fondazione di Ricerca e Cura "Giovanni Paolo II", in Campobasso, Italy. Both for wine and beer the key is moderate and regular drinking. The research, published today on line by the European Journal of Epidemiology, using the statistic approach of meta-analysis, pooled different scientific studies conducted worldwide in previous years to achieve a general result. This way it has been possible to examine data concerning over 200,000 people, for whom alcohol drinking habits were associated with cardiovascular disease. Results confirm what was already known about wine: a moderate consumption (approximately two glasses per day for men and one for women) can lower the risk of cardiovascular disease, up to 31% less when comparing to non drinkers. What this research adds are new data on beer. For the first time, in fact, evidence about dose-dependent effect is shown for this beverage. Maximum protection is observed, for a beer containing 5% of alcohol, with a consumption of slightly more than an English pint a day. "In our research – explains Simona Costanzo, first author of the paper - we considered wine and beer separately: you first observe a reduction in cardiovascular risk with low to moderate drinking. Then, with an increasing consumption, you can see that the advantage disappears, until the risk gets higher. The interesting part of our research is that, among the studies selected for this meta-analysis, there were 12 in which wine and beer consumption could be compared directly. Using these data we were able to observe that the risk curves for the two beverages are closely overlapping". But beer as well as wine, drinkers, should be cautious before toasting too much at these results. "What we are talking about – says Augusto Di Castelnuovo, head of the Statistic Unit of Research Laboratories and a pioneer in alcohol epidemiological studies - is moderate and regular drinking. I think we will never stress enough this concept. Wine or beer are part of a lifestyle. One glass can pair with healthy foods, eaten at proper time, maybe together with family of friends. There is no place for binge drinking or any other form of heavy consumption. "The data reported in our meta-analysis – Di Castelnuovo emphasizes- cannot be extrapolated to everybody. In young women still in their fertile age, as an example, alcohol can slightly raise the risk for some kind of cancer. This could counterbalance the positive effect on cardiovascular disease and reduce the overall benefit of alcoholic beverages on health". In the similarity between wine and beer regarding positive effects on cardiovascular health there is a still unanswered question: the evidence we are observing derives from alcohol alone or from other substances contained in beverages? Wine and beer are different in composition, except for alcohol, so we could think this is the main player. But they both contain polyphenols, albeit different ones. Researchers at Fondazione "Giovanni Paolo II" underline how this is something to look at more closely in the future. "A research like this - comments Giovanni de Gaetano, director of Research Laboratories at Fondazione "Giovanni Paolo II" – is part of a concept that our group strongly pursues: to look at people's real life. Health and disease are conditions deriving from our lifestyle. New therapies, new drugs, are extremely important. But a healthy life, with a strong attitude toward prevention, is the key element of the medicine in the years to come".